the arrow flights this much. Oh, I became really hungry now. to stave off my starvation! 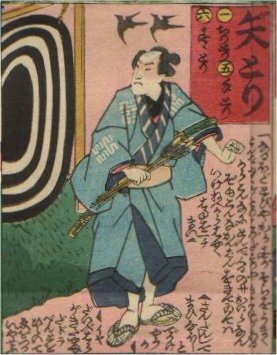 Those who practiced prostitution by shooting range in downtown or precincts were called Yatori-onna (girls handling arrow). The bow stretches near one meter, the arrow is over 10 cm. The distance between shooter and the target was over 10 meters, which had been born as a play for common people.